Are you wondering who ever won it? Her name is Andrea Wege! 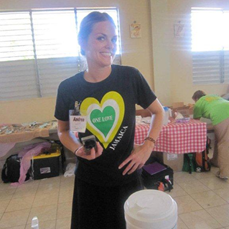 Andrea is a passionate and dedicated volunteer, and we are so lucky to have her support in Jamaica. She is 29 years old and is a color technician at Gene Juarez Salons and Spas in Seattle, WA. She began volunteering with Great Shape! in 2010 after inspiration from her mom Diane Wege, also known as Mama D to the Great Shape! family. “…I saw how much she lit up with passion and love every time she spoke about Great Shape! with strangers and friends, spreading the word about the work they do there,” said Andrea. Despite brushing off her mom’s offer to go for five years, it finally sunk in that she would find it to be an amazing trip. Andrea says deciding to go to Jamaica with Great Shape! and experiencing firsthand what her mom had been raving about was the best decision she has ever made. She described how welcoming and loving everyone is including her co-volunteers, the employees of Sandals Resort, and all those eagerly awaiting treatment at the clinics. “I think the hugs, smiles and complete gratitude from the community and fellow volunteers is my favorite part of Great Shape!” Andrea said. One particular moment of Andrea’s trip that stands out to her is last year at Sav La Mar. Andrea met a man named Garth at the end of the day who was about 33 years old. Garth, showing Andrea his mouth, asked Andrea if he could see the dentist because it was hurting. He also pointed his stomach saying that it also hurt because of his mouth. Moved with compassion, Andrea made a note on his paper to come back the next day so he could be helped and she informed Dr. Brian of Garth’s situation. Two days later Andrea ran into Garth with a mouth full of gauze. He shook her hand, hugged her, and thanked her for helping him. It was that moment along with the kindness of a beautifully handwritten thank you card from Garth that brought tears to Andrea’s eyes. “I am thankful for Great Shape! and 1000 Smiles for helping these communities and lives. With all the new preventative programs I have hope that there will be less situations like Garths and so many others,” Andrea expressed. Andrea won the golden ticket raffle for a refund on her project fee for her 3rd trip to Jamaica with Great Shape! inc. this year. Her ticket was drawn from 55 entries on February 29th by Great Shape! Executive Assistant Tiffany Rhinaldi. Andrea jumped up and down with excitement at her work when she found out she won. “I am absolutely grateful for this gift and cannot wait to share my love in Jamaica this year! My dial is cranked up,” she exclaimed. To join Andrea and other passionate volunteers in Jamaica, visit gsjamaica.org and email tiffany@gsjamaica.org for more information!